First graders are ready for academic exploration and are engaged in learning through movement, stories, and the arts. 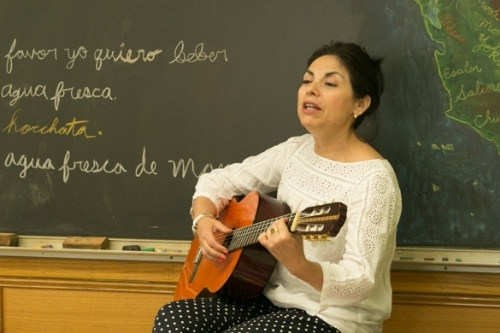 The children and their Class Teacher begin a multi-year journey together, and Specialty Teachers introduce subjects such as Mandarin, Spanish, and Music. Teachers cultivate a spirit of respect and interest in learning that children will carry through the grade school years. Stories, poetry, and songs bring language lessons to life. Children create their first writing and arithmetic books. Mental math practice begins in first grade and continues through the grades. There is plenty of time for outdoor exploration and artistic expression. First graders are captivated by fairy tales and folk tales. The teacher shares stories of a courageous peasant, a greedy wolf, or clever children who persevere to overcome hardship. The children fill their Main Lesson books with illustrations and characters that represent letters of the alphabet. First graders begin twice weekly classes of both Mandarin and Spanish. The oral, immersive instructional approach draws on children’s natural powers of imitation; there are songs, stories, and rhymes instead of direct translation or grammatical instruction. Children absorb the musical nature of the languages and gain meaning through visuals, gestures, repetition, and intonations.